Addiator is a trade name of Addiator Gesellschaft of Berlin, which manufactured very popular, small, hand-held, stylus operated, mechanical calculators of the same name. Over the years there were many manufacturers of this type of calculator, but in the same way that 'Hoover' has become synonymous with vacuum cleaner, so 'Addiator' became synonymous with this type of calculator. This is a British Sterling currency calculator for the old £sd (pounds, shillings, and pence) currency in use before 1971. See the Sterling Currency Calculators section for further details. One side of the instrument is used for addition and the reverse for subtraction. The stylus advances each column by the number to be added or subtracted, with carry possible to the next column. These early Addiators are quite large items, though were the pocket calculator of the day. Later models were much smaller, as shown at the bottom of this page. For instructions on using Addiator-type machines see http://www.mechrech.info/anleit/addengl.pdf. This type of calculator was introduced by the Frenchman Troncet in 1889. The Addiator brand was one of the most popular calculators of this sort, and the name is often used to refer to the type generally. They were very popular and many models were manufactured into the 1970s and specialist ones even into the 1980s. They were often much smaller than these early Addiators, as illustrated in the models at the bottom of this page. Harry Mernick has kindly provided these excellent photographs and details of his GEM calculator. The calculator set in the zero state. The calculator in use with the total showing in the result windows of £54 3s 1 1/4d (that is 54 pounds, 3 shillings, and 1 1/4 pennies). Size: 107 x 220 x 6.5 mm (4.25" x 8.7" x 0.25"). Made in England 1880s - 1900s. This GEM calculator is an unusual and very early example of the "Addiator" type of calculator. The catalog entry for one which has been on display in the Science Museum in London says that it was patented by J. Guthrie in 1890 (patent specification, 1890. no. 15062) and that it was presented to the museum in 1905. It is made of wood, probably pine, with varnished card top surface and sliders. There is no zeroing mechanism, the sliders have to be individually returned to zero. 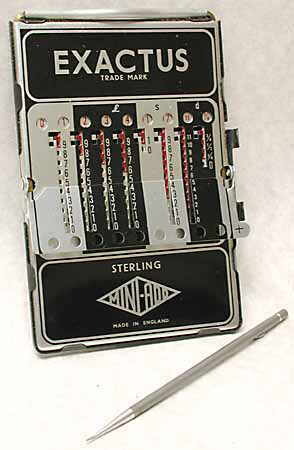 This model is a British Sterling currency calculator for the old £sd (pounds, shillings, and pence) currency in use before 1971. See the Sterling Currency Calculators section for further details. Grateful thanks to Harry Mernick for supplying the photographs and information of this machine. The two sides of the Kingson Four Rule calculator with an 'Addiator' on one side (left) and a slide rule on the other (below). Addiator Addfeet Junior feet & inches calculator. Exactus Mini-Add, £sd Sterling currency calculator. In this model a flap is flipped over to change from addition mode to subtraction mode. 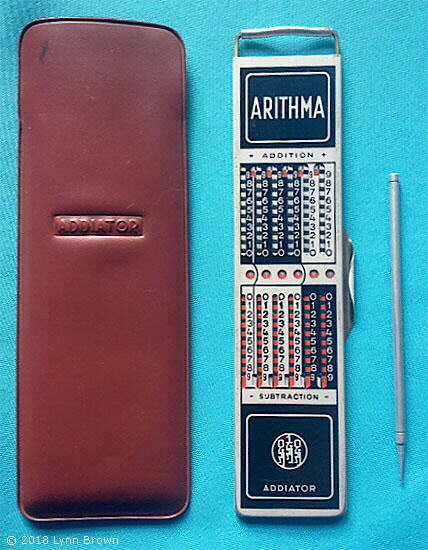 Addiator Arithma decimal calculator, with pouch and stylus. Photograph courtesy of Lynn Brown. 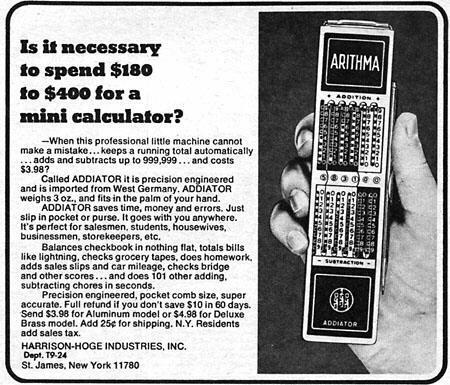 An advertisement for the Addiator Arithma from 1972, showing that at US$3.98 they were much cheaper than the early electronic calculators of that time, though not as capable. Within 4 years, with mass production, the cost of electronic calculators would drop to near this level. There are more models of "Addiator"-type machines in the Featured Non-Decimal Calculators section. Kees Nagtegall has produced a catalogue showing photographs of dozens of different models of this type of calculator at https://issuu.com/keesnagtegaal/docs/catalogue-2015-1.3.